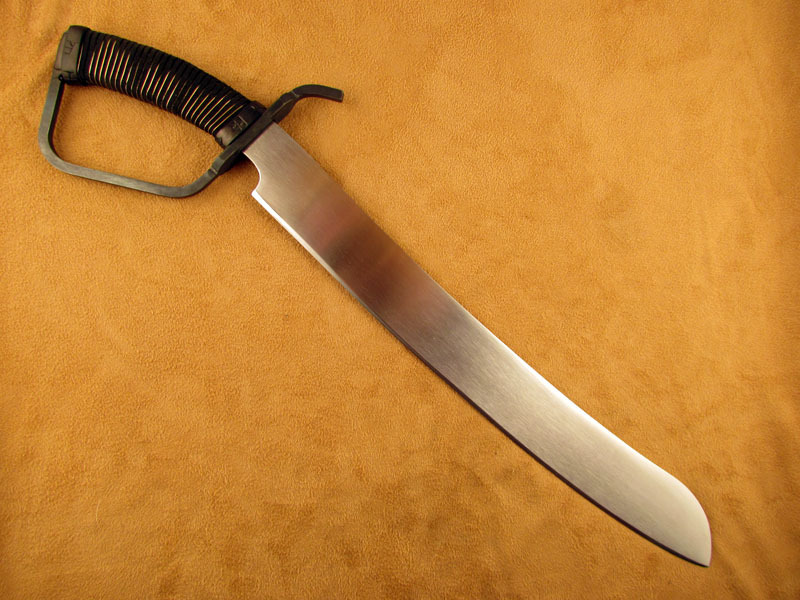 The cutlass is a short sword in the saber family, usually having a broad, curved blade. It was commonly seen in naval service, most likely due to its ability to cut, thrust, and brawl in close quarters. 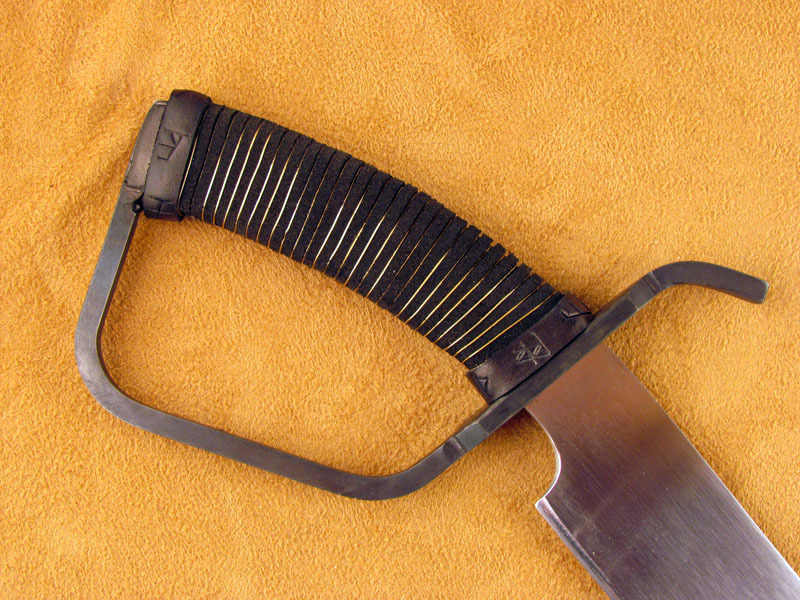 It was also no doubt used to cut rope, canvas, and even brush when carried as a side arm by landing parties. This is a custom piece that evolved over time as my client and I discussed what he was looking for. 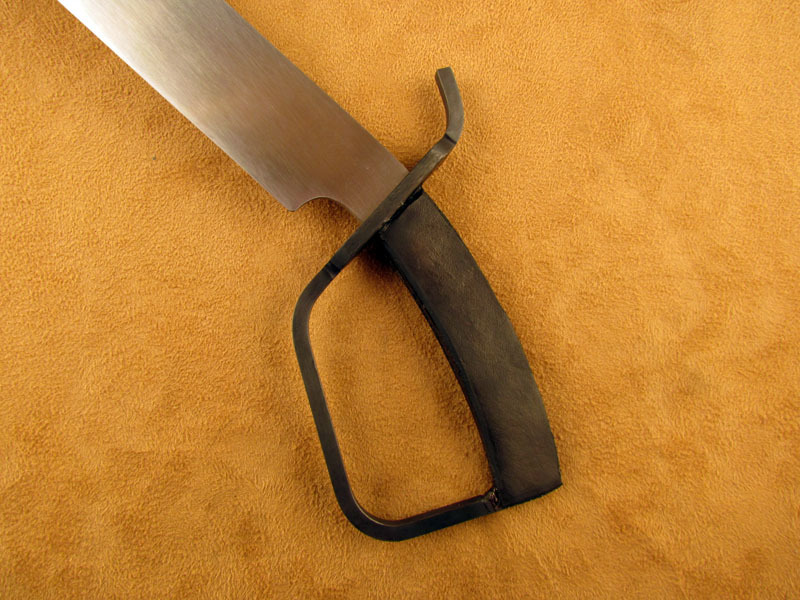 We talked about seax, langseax, WWI trench knives, classic Viking swords (but shorter), and D-guard Bowies. What we arrived at was an interesting seax/cutlass hybrid with a steel D-guard. At no point did either of us say the word “cutlass,” but that’s what this mostly resembles. Once a design was decided on, I chose 0.25″ thick 5160 spring steel for its toughness and ability to withstand shock. 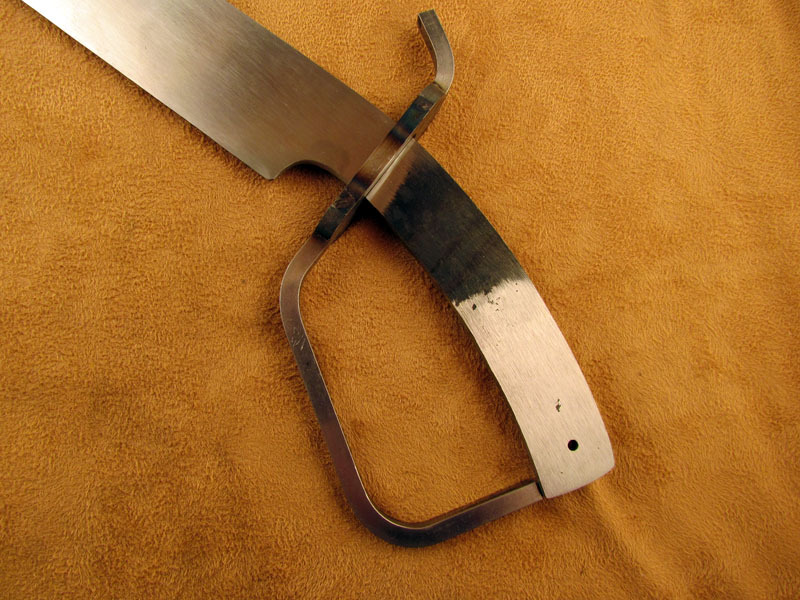 I ground a pre-form and the initial bevels, then forged the final shape. For the last three heats, I quenched the steel in a process called thermal cycling. As is my practice at this point, I normalized and annealed the blade. Next was the rough grinding, during which I removed the forge scale, set up the edge, and refined the shape to close to its final form. Hardening consisted of heating the steel to 1525° F and quenching in oil, followed by two tempering cycles at 600° F to yield a Rockwell C hardness (RcH) of ~54. 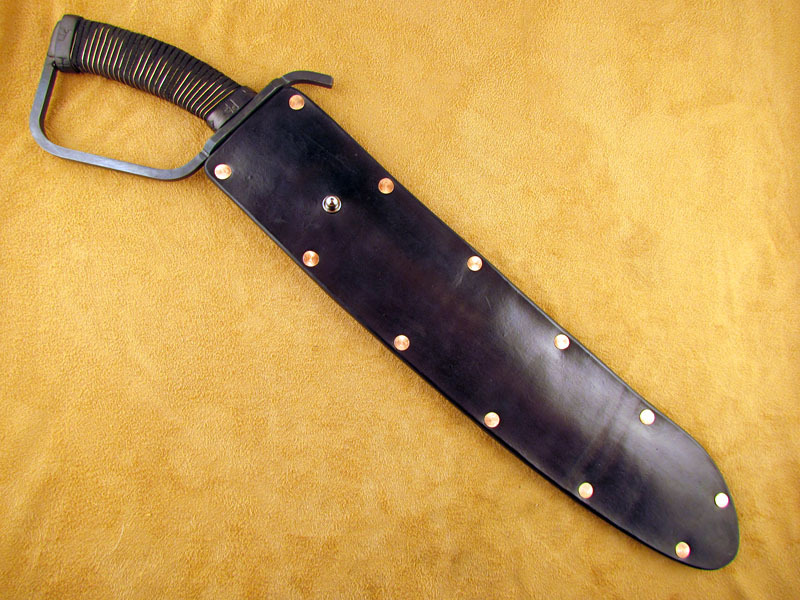 I usually like a sword, especially a chopper, to be ~52 RcH, but this is a thick, heavy blade. It can stand to be a tad harder and still be plenty strong. 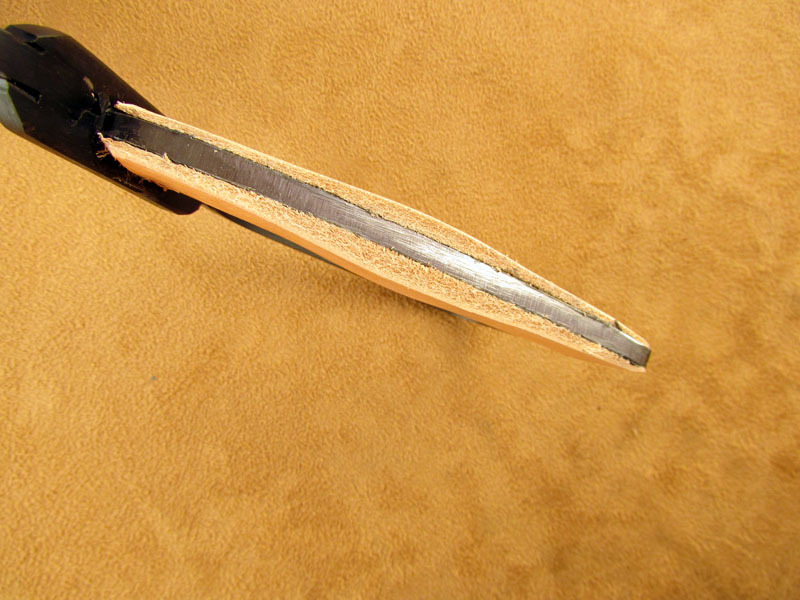 While we’re on the hilt, the hilt is defined as everything from the guard to the pommel; guard, handle, pommel. For this piece I tried something new (to me). 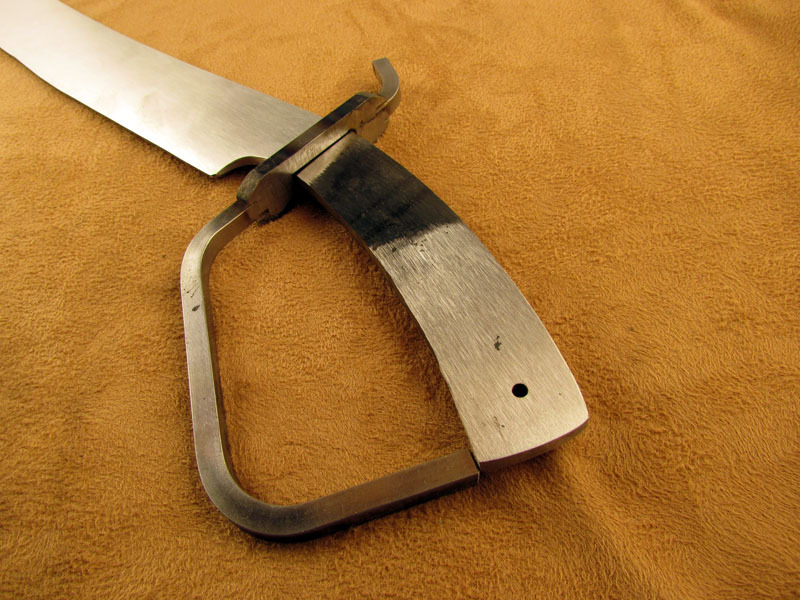 I fabricated the D-guard from 0.25″ mild steel square stock that I shaped in a compact bender. After it was shaped, I MIG welded it together and to the tang. 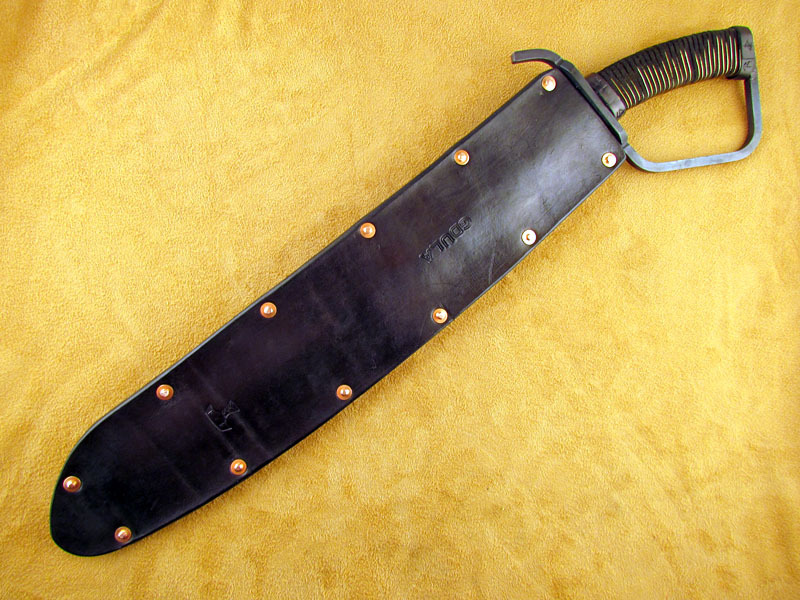 The tang was a little thin so I built it up with leather and then wrapped it in a kangaroo leather thong with the rough side facing out. I have no idea why I have a spool of Skippy or from whence it came, but it seemed right for the job. Wrapped in the grooves of the leather is some brass wire for some visual interest. 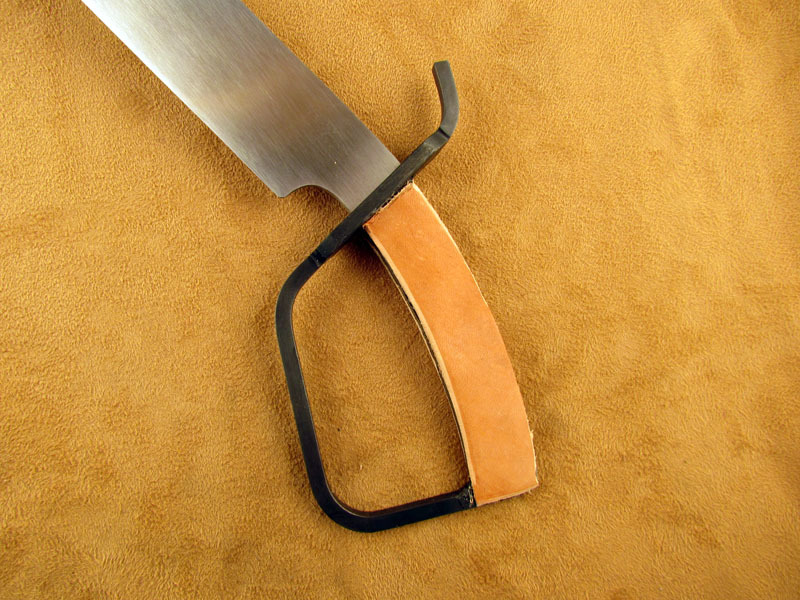 This started as a Norse-themed project, so to maintain that flavor there are leather bolsters with Norse bindrunes at the top and bottom of the handle. A little magical enhancement goes a long way. The sheath is a simple three piece: front, back, and welt, with a Sam Brown stud. It’s dyed black, oiled, buffed, and held together with copper rivets. 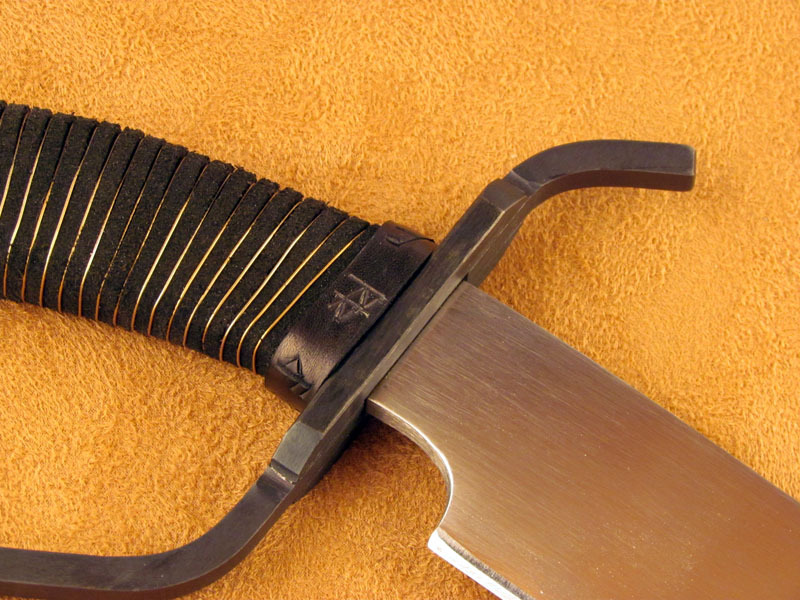 The Sam Brown stud is to provide retention when the sword is worn under the belt or in a frog built to be used with it. All said and done, this sword is a heavyweight chopper, made for heavy, high impact swings. A strong person can also slash with it, but the tip is poorly suited for thrusting. In light of its intended purpose, it’s made from thick stock and its balance is forward, or blade heavy; it will cut like an axe. The cutlass is salty. 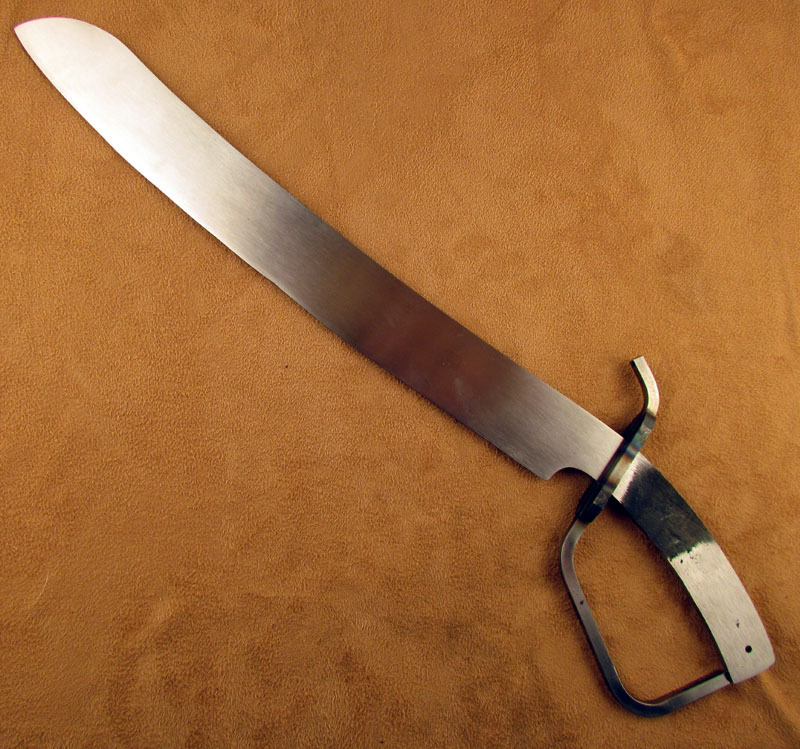 If you’re involved in a nautical- or pirate-themed game, there should be some cutlasses. If you can hear the surf, smell the sea, and listen to the clang of steel on steel, you can believe those are cutlasses you hear. Yarg! For the first time in a long time I’m in a regular game. I love it. It’s given me more drive to make more Real Steel, and it’s on the way. It’s a brutally cold and snowy winter here in the northeast, so video will be difficult, but I have a plan to do some in my shop. Please be patient and I’ll figure it out. Coming soon will be a falchion! It looks like the blade is slightly more than 1 feet in length, am I correct? Good eye, Darkjoy. The blade is 15″. Overall length is 17″. Sorry, I should have included that. I love this one, and I was *going* to say “I need two of these!”… but then I remembered Jeremiah Io… and his wonderful blades…. Hey, Jack! 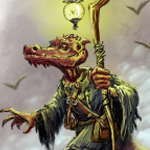 It’s good to see you in the warrens! Where in New England are you (if I may ask)…and do you have a store or gallery that people can walk in to browse your work? -I also live in New England (southern MA) so I was wondering. @Matt Monteiro – I’m actually in upstate NY, about 100 miles North of NYC. I don’t have a retail store, just a shop and forge at my house. I do maintain a website where I have a list of items currently for sale as well as a gallery of past work. There are contact forms at the bottom of each page if you’d like to email me. Excellent article. I can never get enough Real Steel. Thank you, Charles. More on the way. Beautiful work. Looking forward to the falchion, as frequently as I seem to wind up with one in-game! Thanks, Chris. I’ve got several things on the bench right now, including the falchion. It may actually make two Real Steel; once for the build and a second time for a video a little later.